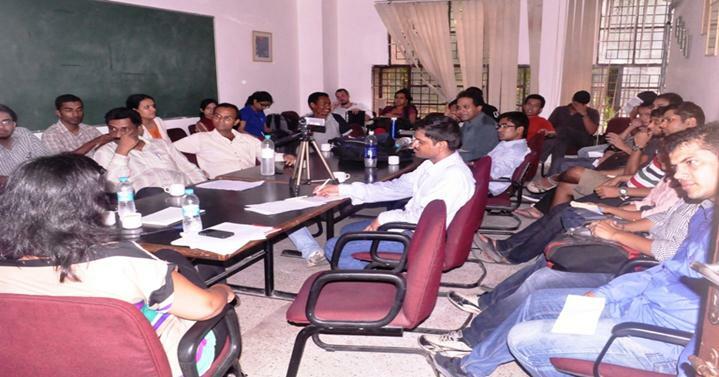 On 30th July The Distinguished Lecture Series of The Global Research Forum on Diaspora and Transnationalism (GRFDT) held at the Centre for Study of Social Systems, JNU. It featured a talk by Dr. Ingrid Therwath of the Centre de Sciences Humaine, New Delhi on the issue of Hindutva, the Diaspora and the Internet. The session statred was put into motion with a speech by the chair person Professor R.K. Jain,an eminent diaspora scholar and former professor at JNU, on the need for macro geo-political perspective. With the communication revolution taking a firm hold of activities around the world, Professor Jain, in his address pointed out the blurring of rigid state boundaries leading to a more transnational world. He highlighted the difference between the concepts of ‘Hindutva’ and ‘Hinduism’, which are often misunderstood as the same. He also posed a question as to how the people seen as the upholders of ‘Hindutva’ were adjusting their sights with respect to contemporary Indian society and its Diaspora, describing the ever changing nature of Diaspora studies. With this note, the floor was opened to Dr. Therwath to start her lecture. Dr. Therwath started by explaining how her research was part of a 27 member research team working on the collection of research studies relating to ‘e-Diaspora’ for the Foundation Maison des Sciences de l’Homme ICT Migrations programme, with her corpus relating to the spreading of a ‘Globalised Hindutva’ online. Providing a detailed look into the Research Methodology she undertook for this particular research, Dr. Therwath explained the data mining process and the widespread study to find Hindutva related sites on the web. By using various softwares, notably Metacrawler, which allowed for the jumping to hyperlinks to other sites from one particular website, and by using the process of Geo-localisation, i.e, tracing a particular website’s I.P. address and then correlating that with the website’s material, Dr. Therwath was able to create a corpus of data, which was then fed into excel sheets and create a “network map”, showing the geographical locations of each website thus found. After having explained the Research Methodology, Dr. Therwath proceeded to discussing the findings of the study. She explained how the advent of the internet has led to the blossoming of ‘Hindutva’ as a global phenomenon and how it was carried forward by the self-proclaimed upholders of Hindutva, the Rashtriya Swayam Sevak Sangh. She then proceeded to explain the history of the Rashtriya Swayam Sevak Sangh’s operations in foreign lands. From The establishment of the first RSS Headquarters in Kenya by Jagdish Chandra, to its spread throughout East Africa and its moving out to Leicester in England and eventually to Canada in the 1970s. Ever since then, luring the Diaspora had always been a major policy point for the RSS. The RSS then established a twin structure in these foreign places, generally known as Hindu Swayam Sevak Sangh (HSS). The recent trend of the using the internet for the proliferation of Hindutva ideals started in the 1980s with Hindu symapthisers amongst the Diaspora in the United States who had migrated along with the internet boom, an interesting precursor to developments mentioned by Dr. Therwath later in her speech. Further commenting on the approach taken to study Diaspora on the web and researchers’ predisposition towards sub-altern/ post-modern studies regarding the finding of the voice of minority groups on the net, Dr. Therwath used a more exhaustive approach towards web studies by searching for traces left behind on the websites related to Hindutva. Taking all the available data with the network maps and after finding these traces, the study found a major polarisation with respect to the geographical locations of these websites- with one pole centered in India and more importantly the other pole centered in the United States. These US centres provided most of the content for the websites. Another very interesting fact which the study brought forward was the sharing of servers between the Hindu extremist groups and the Jewish extremist groups. This example of different Diasporic groups finding common ground in a foreign land, in this case the common ground being Islamophobia and a mutual feeling of historical oppression was remarked with great exclamation throughout the participants. A further study into the profiles of the people who were behind the websites found an overwhelming majority of them, 92percent in fact, to be upper caste, middle to upper caste males between the ages of 15 and 25. A further study into the economic activities in relation to the websites found that funds raised by such websites, who channel the sentiments of sympathisers through charitable organisations and lobbies were funneled towards the fanning of communal places, especially in the case of the Godhra riots. These websites then came under the scrutiny of the home country, particularly in the UK and the US, who tried desperately to shut down these sites. In order to avoid such scrutiny, the websites were converted into blogs. The charitable institutions also changed face once the restrictions started to take force. Giving a profile of the three type of people these websites were aware of- namely the group of people sociologically fit for Hindutva for further recruitment for the cause, the changing face of Hindutva to appear as championing Hinduism (two concepts very different from each other as mentioned by Dr. Therwath earlier), and the monitoring agencies in order to escape their gaze, Dr. Therwat brought her insightful and very informative discussion to an end. The discussion was followed by a highly stimulating and informative question-answer round, in which a wide range of topics were discussed followed by a formal vote of thanks by Dr. G. Srinivas.